ndia has once again come in a strong position in the second test as Murli Vijay and Pujara both scored unbeaten centuries to put India in the lead of 74 runs over Australians. Pujara is not out at 162 whereas Vijay is unbeaten on 129.
one for 237 runs for the loss of 9 wickets. India started the morning session with 5 runs for no loss. Vijay needed to perform well in the test as he had failed in both the innings of the first test played at Chennai. He made sure this time that the runs come off his bat as he played patiently. However, Sehwag was again unable to perform as he fell for just 6 runs. 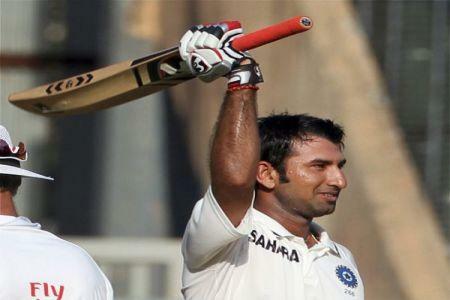 After Sehwag’s departure, it was Pujara’s turn to perform in order to confirm his spot in the side. Both Pujara and Vijay played cautiously in the first session of the morning, scoring just 49 runs and played straight and avoided playing cross shots. As the day progressed and both the batsmen got well set, the couple started to come down the track to spinners, hitting the leg side, the off side and to the covers. Both were merciless and increased the run rate in every coming session. They scored a partnership of 106 runs in the second session and 151 runs after the tea in the final session. Pujara continued his good run of form in the domestic games where he scored double and triple centuries to score another 150 plus score. He scored from 100 to 150 runs in just 42 balls.